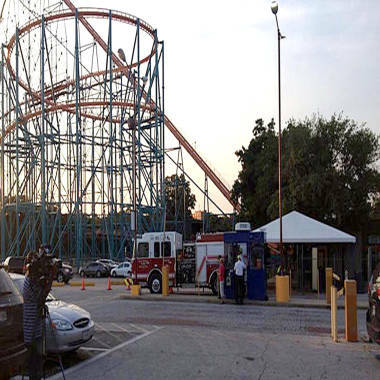 A woman died Friday at Six Flags Over Texas near Dallas while riding the world's steepest wooden roller coaster. NBC's Sarah Dallof reports. A woman died Friday at Six Flags Over Texas near Dallas while riding the world's steepest wooden roller coaster, the park confirmed Friday night. Six Flags Over Texas bills the Texas Giant as the world's steepest wooden roller coaster. The Texas Giant, a 14-story-high, 4,900-feet-long roller coaster that is among the premiere attractions at the park in Arlington, Texas, was closed, the park said in a statement. The park said in its statement that the woman died "on" the ride, but park visitors told NBC 5 of Dallas that they saw her fall from the roller coaster shortly after 6:30 p.m. (7:30 p.m. ET). They said workers on the ride directed paramedics to her location. Nadine Kelley, who had been waiting in line for the ride, told NBC 5 of Dallas that riders who were sitting behind the woman said that "right when they came down off the first bump and hit that first turn, she flew out." The woman was accompanied by two children, who were "hysterical," Kelley said. "They were saying that their mother flew out of the car." "It was sad. It was very sad," she said. "We kept telling them to let them out because they were hysterical. The daughter and the son said, 'We have to go get my mom. We have to go get my mom.' We were kind of in disbelief, and we just said a prayer for her." In a statement released Saturday, a park spokeswoman said an investigation into the incident is ongoing. "We are committed to determining the cause of this tragic accident and will utilize every resource throughout this process," Sharon Parker said in a statement. "It would be a disservice to the family to speculate regarding what transpired. When we have new information to provide, we will do so. Our thoughts, prayers and full support remain with the family." Carmen Brown, of Arlington, told the Dallas Morning News that she had been waiting in line as the victim got on the ride. She said the woman told a park employee that she thought she was not properly secured in her seat. “He was, like, ‘As long as you heard it click, you’re fine,’” Brown told the paper. The identity of the woman was not immediately reported. Arlington police didn't immediately respond to a request for more information. The Texas Giant opened in 1990 and underwent a $10 million renovation two years ago, adding a steel track to the wooden roller coaster and making the ride higher and faster. It's the steepest wooden roller coaster in the world, the park says on its website, and has a record bank of 95 degrees. In another incident Friday, seven people were injured at the Cedar Park amusement park in Sandusky, Ohio, when their boat on the Shoot the Rapids thrill ride rolled backward down a hill and overturned, officials said.